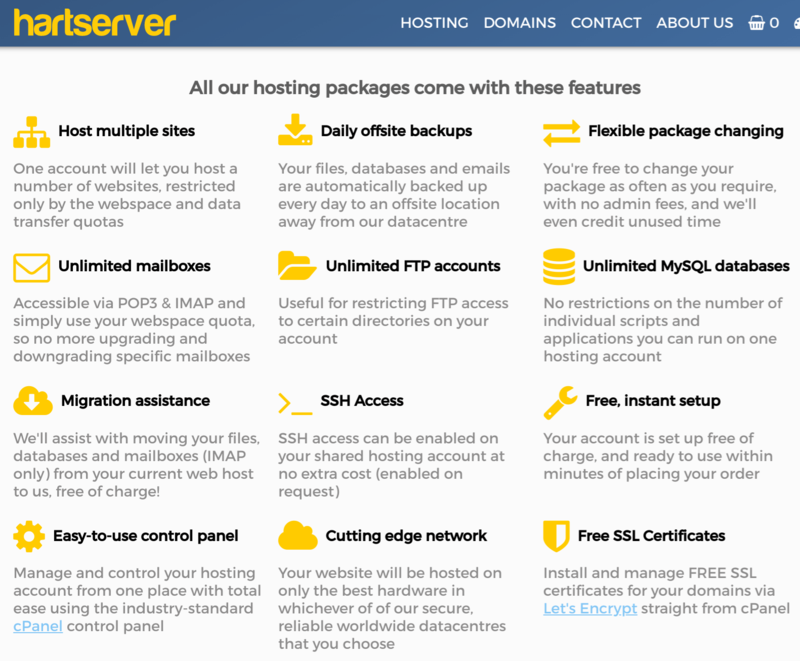 Hartserver Review 2019: Is Hartserver a Good Hosting? Hartserver is a U.K. hosting company specializing in shared hosting, VPS solutions, hybrid, and dedicated server hosting. Since opening for business in 2004, they have continued to combine affordable hosting options with excellent customer service. Hartserver was established in 2004 in the United Kingdom. Over the years, this company has perfected the art of web hosting by investing in enterprise-grade Dell servers and by providing great customer service. Their high-quality, affordable hosting solutions are offered to clients all over the world. Investment in enterprise-grade Dell servers and a high-performance, reliable Cisco Gigabit network allows Hartserver to offer a 99.9% uptime guarantee regardless of your plan. Since you can’t do business without your data, Hartserver supports business continuity thanks to its daily offsite backups. They back up your emails, databases, and files automatically to an offsite location, and you can restore any lost data with just a few clicks. One thing I really like about Hartserver is their choice of the trusty cPanel control panel that makes it easy to manage your hosting, especially if you are coming from another host. You can set up mailboxes, install your free SSL certificate, and perform many more domain management tasks. Hartserver’s packages are affordable, they don’t charge setup fees, and your account is created instantly once your payment has been made by credit/debit card or PayPal. You can renew on a monthly or annual basis with no contract, and the 30-day money-back guarantee gives you some time (in a sense) to try before you buy. You might even be able to save some money by securing a discount on your initial subscription. All Hartserver’s packages come with excellent 24/7 customer support from highly skilled professionals who can be contacted by phone, live chat, or email. They are also active on social media, and you can reach out to them via Instagram, Facebook, and Twitter. You can ask them to help you with your migration from another host, too. HartServer is a U.K. hosting provider with top-of-the-line infrastructure and solid hosting plans that are backed by a 30-day money-back guarantee and excellent customer support. Get solid hosting with free SSL from Hartserver. Wondering how Hartserver stacks up against other Web Hosting companies? Enter any other Web Hosting company and we will give you a side-by-side comparison.